Crimeans came from different cities and villages of the peninsula to meet Karametov. 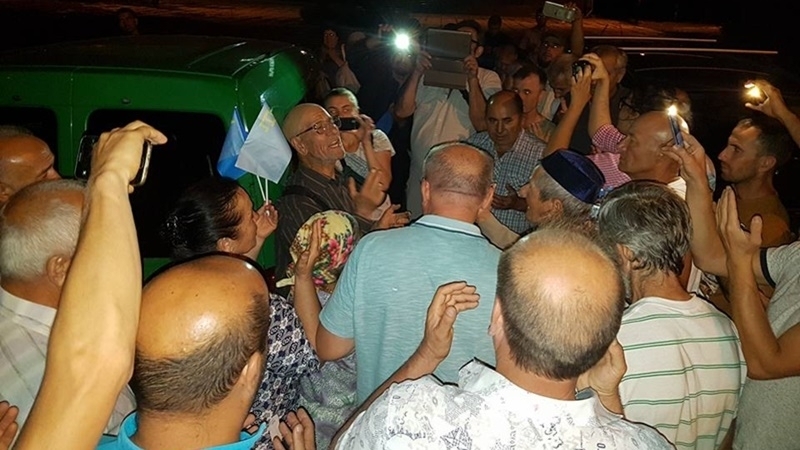 In the occupied Crimea on Saturday evening, August 19, the 76-year-old Server Karametov was released after a 10-day arrest. “Server Karametov was released, but not at the appointed time and not in the designated place. He was taken out earlier and left at the central bus station (alone, without any money and without warning anyone). That’s the way they treated a 76-year-old old man, suffering Parkinson's disease, after 10 days of unlawful administrative arrest. Server called his son, who took him to the place where people met him,” Crimean Solidarity reported. Aishe Umerova organized a live broadcast on Facebook and wrote that "people from all over the Crimea gathered to greet Karametov." August 20, in the town of Stary Krym in the Khan-Uzbek mosque, a dua was held on the occasion of Server Karametov release. “He is lovingly called Server Qaraman among people. He lit many sleeping hearts that day when he came out and told the truth about the political prisoners of Crimea!” Crimean Solidarity writes. The 76-year-old Server Karametov was released only on August 19 after a 10-day arrest, which he was serving for allegedly "disobeying the police." Earlier, QHA reported that Server Karametov was detained on August 8 for a single picket outside the "Supreme Court" of the Crimea. At the time of the arrest, Karametov was standing near the "court" building with a placard writing "Putin, our children are not terrorists!" in big letters and "Stop accusing the Crimean Tatars". The Crimean court controlled by the occupation authorities arrested the activist for 10 days for allegedly "disobeying the police" and fined 10,000 rubles.